In effect, however, Madero had launched the revolution nearly two years earlier with his book, La sucesión presidencial en 1910 (the Presidential Succession of 1910). Dated 1908 but not in circulation until early 1909, La sucesión presidencial en 1910 was a liberal rendition of Mexican history and a ringing appeal for free and open presidential elections, effective suffrage, and no reelection, in other words, nothing less than the retirement of Porfirio Díaz, who had held or controlled the presidency for over three decades. It was around the ideas and call to action in La sucesión presidencial en 1910 that, with lightning speed, Madero built his Partido Antireeleccionista, or Anti-Reelection Party, and his own candidacy for the presidency. Before that election of 1910, Madero was jailed in San Luis Potosí and, thanks to the customary ballot-stuffing, the elderly Díaz claimed for himself another presidential term. But Madero escaped, and from the launchpad of Texas, he soared back onto the Mexican national stage as leader of the 1910 Revolution. In a matter of months the Díaz regime crumbled; in May of 1911 Díaz was on his way to exile in France; that same month, after a wildly popular nationwide campaign, Madero won the presidency, and went on to serve from November 1911 until his assassination in the coup d'etat of February 1913. 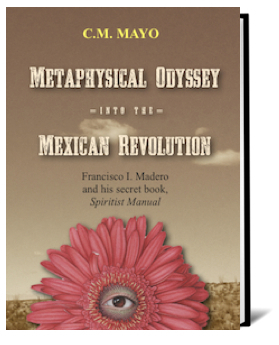 Less known to scholars of the 1910 Revolution is Madero's subsequent book, Manual espírita (Spiritist Manual), written in 1909-1910, and published in Mexico City under a pseudonym, Bhîma, in 1911, when he was President-elect.